Warped Reality: Rafael Nadal Wins Arm Flailing And Grunting Competition! Rafael Nadal Wins Arm Flailing And Grunting Competition! Let it be known that on September 13, 2010, Rafael Nadal is now the world champion arm flailer and grunter! A title awarded only to the most deserving arm flailer and grunter, this year, Nadal takes it home as the world's greatest! 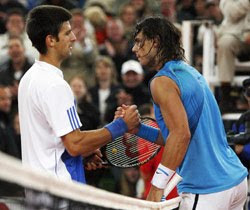 It was an intense showdown, Russian cursewords under his breath, Djokovic put up a very fierce show, but at the end, there can be only one... only one will go home with the glory... only one can have the worlds scratchiest throat... only one can have the worlds limpest arms... one... to rule them all!! Tensions were high and the pressure kept rising as the competition was postponed for a second time due to raining on the scene. Once play resumed, the players came back as aggressive as ever, arms pumped up for wild and uncontrollable swinging, throats parched so as to provide maximum gruntiness (yes gruntiness is a word). Congradulations to a game well played Nadal and Djokovic, great skills and efforts, the world looks forward to seeing the same intensity and passion in next years game!